Do you have trouble buying mothers day gifts??? I sure do, every year its a race to the finish line to get gifts for my mum and mother in law from myself and my husband. Then don’t even get me started with how much trouble we have finding gifts for them from all three granddaughters! I hate giving soaps, slippers and all those regular gifts. Whilst I was searching the internet for mothers day gift diy ideas for the kids to give. 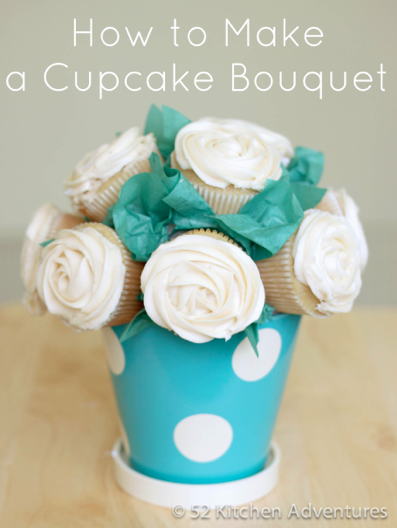 I found this great DIY for a cupcake bouquet, isn’t it just devine !!?? I stumble across it over at 52 kitchen adventures. Stephanie has done such a fantastic job it looks to good to eat. I think we are going to give it a try this year, the girls will have a ball making it I am sure! This entry was posted in DIY tutorials and tagged #cake, #diy #, #lottieandme, #partyplanner, cupcakes, melbourne, mothersday. Bookmark the permalink. Categories Select Category DIY tutorials For the Boys For the Girls For the Lovers Friday Favorite Finds In the Press & Seen on Recipes Testimonials Unisex themes What do we do? ?